Welcome to the Canon Powershot G15 digital camera giveaway, we are so excited to share it with you as we have teamed up with some wonderful bloggers! We all know too well that life flies by fast, especially when you have kids. It's vital to capture these moments so you have something to look back on when they are all grown up. 42nd Street Photo is a camera store based in New York City and they have a vast selection of digital cameras and camcorders. They have been in business for over 40 years, established back when we used to capture memories on film! It's convenient to shop there as they have great deals and sales, a variety of ways to pay, free shipping, and a free cleaning kit with your purchase. 42nd Street Photo is generously sponsoring this giveaway for the Canon Powershot G15, a small camera with big performance. This camera is a great step-up from the average point-and-shoot with a lot of features of more expensive DSLR cameras in a compact package. It also receives raving reviews from users! 12.1 MP High-Sensitivity CMOS sensor, enables rapid continuous shooting, no lag! Purchase: You can purchase the Canon Powershot G15 digital camera at 42nd Street Photo. Win It! 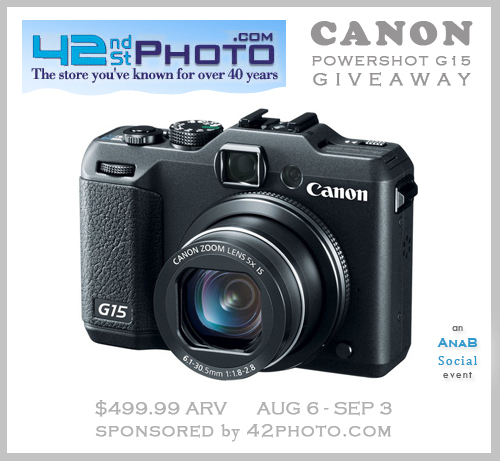 42nd Street Photo is generously blessing one winner with the Canon Powershot G15 digital camera! Special thanks to AnaB Social for hosting this giveaway. 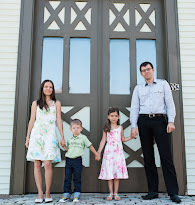 Huge thanks to 42photo.com and all the fabulous participating bloggers as well! Giveaway ends September 3rd at 11:59 pm, open to residents of US and Canada, ages 18+. See detailed terms and conditions on entry form. To enter please use the Rafflecopter form below (see directions on how to enter here). Thank you! I like that The Canon DIGIC 5 Image Processor works with the PowerShot G15's image sensor to enable faster processing speeds, delivering detailed images in many low-light situations without the need for artificial light sources. I would like to have one of the cases/carry bags. The current case I have now for my camera isn't very good for protection! I would love any DSLR but have had my eyes on some Canons lately! i love the Smith Victor KT500 500W Photoflood Light Kit! The Sea & Sea waterproof camera housings are really cool. Underwater shots are amazing but you need special equipment. I love the belt spy camera, cool! What an awesome camera and giveaway! I love all of the features about it since the only thing I have now to use is my iPhone...LOL! The slingshot camera bag looks perfect for hikes. that it works well in low light. I would love the Canon SX50. I've coveted it for a while as a lighter camera to bring on outings with my family. I like the Canon Vixia HF-M40 16GB Flash Memory Camcorder. The Dinkum Systems ActionPod Pro For SLR Cameras would be helpful to hold the camera still. I’m not good at that! Oh I would love love love a Nikon D7000 but it's not in my budget. A girl can dream, right? I like the Panasonic VDR-M75 DVD Handycam Camcorder. Thanks. The spy camera's are neat! I like that it's a point and shoot camera - not too complicated. I love the D3200 24.2 Megapixel Digital Camera....wow!!! And is red, my favorite color.. I'd also love the Rebel Digital T3! I would like to have the Canon EOS Rebel Digital T3i 18.0 MP Camera W/ 18-55mm IS II Lens. Nikon's D3000 would be very nice to use. I especially like the low-light performance. Would also like the GoPro HD Hero 3 Black Edition. I would love the Monster Beats by Dr. Dre Beats Solo Headphones with ControlTalk. I also like the Nikon D5100 16.2 Megapixel Digital Camera W/ Nikon 18-55mm VR Lens. I would love to have the GoPro Hero 2 Outdoor Edition, Item: 106974. My grandsons would get the biggest kick out of having the Minox Digital Pen Camera. I love the Fast 5X Zoom Lens, it seems my grandchildren are always in motion so this feature is awesome! I like the Nikon D5100!! I would love one of the specialized cases! I love the Sony DSC-RX100 20.2 Megapixel Digital Camera. I like the 5x zoom and the faster focus and availability to get good photos, my camera has a bit of a delay which makes all the difference when trying to get a pet or grandson to sit still! I love that you can keep shooting continuously and the zoom. Sounds like a great camera! I like the 1080p HD Video Capture because I always wish I had a recording device with me when something cool happens! I like the Canon DC210 DVD Handycam Camcorder, looks like a great idea! The Nikon D3200 is also a nice camera for novices like myself. I also really like the camcorder. I have recently started hiking and would love to learn photography in the process. I like to intelligent image stabilization. My favorite feature of the Canon Powershot G15 is the HS SYSTEM which enables Exceptional Low-Light Performance to ISO 12800. I would like some peace and quiet, if not an Ipod for my daughter. I like the spy cameras. I like the Canon DIGIC 5 Image Processor and how it enables faster processing speeds.